Day Five, That felt better! Time: not sure as the Flip ran out of space so I rode for at least an hour. Big lunch of Shoulder of lamb, Fries and Salad, 1/4 Bottle Red wine. Then went on ride. Cigarettes in the last 24hrs: 2, last of a pack I found up at the house. There’s one more up there. 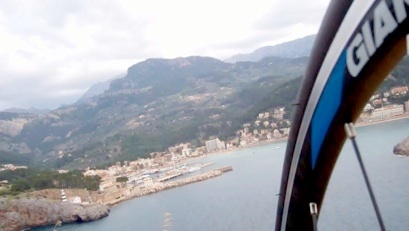 View from the today’s turn around point above Puerto Soller.